Haaaaaaappy New Year!!!! Are you sad to see 2013 go? Relieved to see 2014 arrive? Praying you can get your pants to fit when you go back to work tomorrow? Enough babbling. 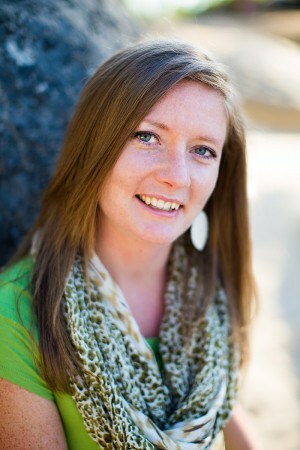 Julia is a lover of all things outdoorsy, fellow curly-haired ginger, and cookbook author (her first book is out in February of 2014!) with a deep love for nutrient-rich recipes. When I want to know about the workings of some wackadoo healthy ingredient, Julia is my personal encyclopedia! Today she is serving up a breakfast that is as delicious as it is good for you…a perfect way to ring in the new year! Howdy, folks! 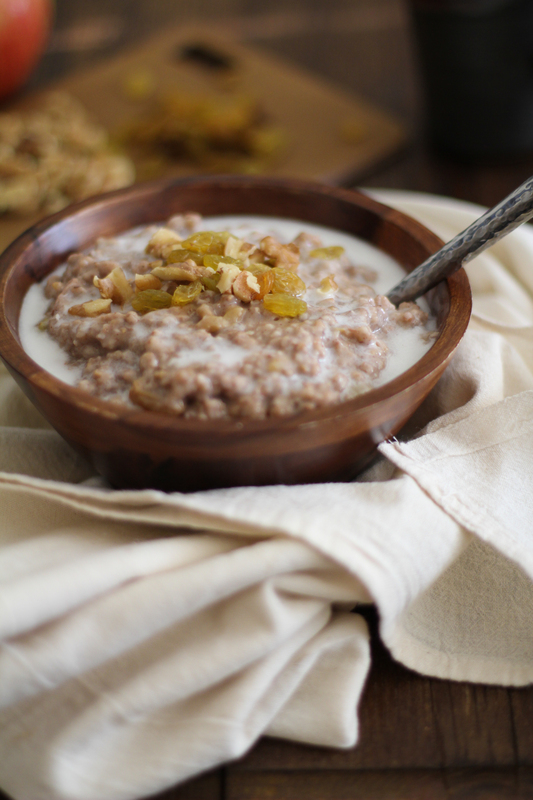 I’m happy to be joining you on Eat Your Heart Out for a delicious crock of oats! Let me first tell you how much I love our girl, Stephie. I love her. She’s incredibly giving and genuine – a real diamond in the rough! Stephie guest posted on my site a few weeks ago with her mouth-watering Double Gingerbread Cake. As I mentioned in that post, Stephie and I use and abuse Twitter for bonding purposes. Have we had extensive Grey’s Anatomy conversations? You bet! Do we tweet each other trashy music videos? Of course! When we are having difficulty writing a blog post (on the reg), do we ask each other for Writer’s Block Ex-lax? No classy lady would do such a thing. So, yes, yes we do. Sidenote: Writer’s Block Ex-lax does not exist in actuality. I’d know, I’ve looked. Just as technology brings us all together, so does food. This crockpot steel cut oatmeal is what I imagine I’d be making every day of my life if I had a rat pack of children running around. It feeds 4 adults (or lots of children), is completely creamy, flavorful, delicious, and is insanely easy to make. You seriously just toss everything in a crock pot, flip the switch, and go to bed. You wake up to a house filled with warm apple-cinnamon scent, and your breakfast is already made! If you’re not accustomed to my recipes, I’ll give you a brief run-down. I tend to use coconut milk as the fat in my recipes in place of butter. For this oatmeal, you’ll either want to use coconut milk or butter so that the oatmeal doesn’t stick to the sides of your crock pot. Also, coconut milk and butter are both delicious, so there’s that. When I’m making oatmeal for more people than just myself, I don’t add sugar, because everyone likes a different level of sweet. To keep it this breakfast all natural, you can add honey, or pure maple syrup. But brown sugar gets the job done real nice, too. Thanks for having me, folks! Until next time – eat well, eat often! Add all of the ingredients to a crock pot and stir well. Place crock pot on the low setting for 7 to 9 hours, until the liquid has been absorbed. If possible, stir the oatmeal part of the way through, but this isn’t mandatory. You can set it and forget it and wake up to a house filled with delicious apple cinnamon oatmeal smell. 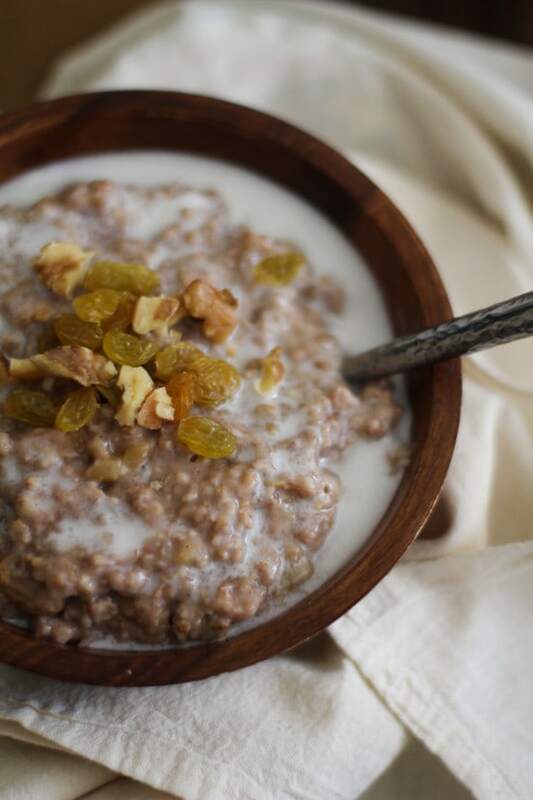 Serve generous portions of oatmeal with your sweetener of choice (honey or pure maple syrup recommended), almond milk, coconut milk, or regular milk, plus additional raisins and walnuts. *You need to add some fat so the oatmeal doesn’t stick to the sides of your crock. Thanks, Julia! Be sure to follow The Roasted Root on Facebook, Twitter, Pinterest, and Instagram so that you never miss a single delicious post. <3 Hugs and snuggles right back! If by “keep me up” you really mean: Keep Steinbeck up. Ha! Thanks for having me, my dear! I hope you had a wonderful New Year’s Eve and aren’t as viciously hungover as I am. Thank YOU! And I was actually very boring last night and drank only a moderate amount of wine. That, however, did not stop me from napping as if I was hungover today. Just because. So glad you like it, Wendy! I’m amazed at how much better oatmeal is when it’s slow cooked. It comes out so creamy and flavorful. Happy New Year! Oats really are the perfect GF solution, aren’t they? They’re my favorite trick when making things for my GF friends! I’m so glad to have you here! And isn’t Julia a smarty-pants? I love the idea of waking up to breakfast all ready for me! I love the fruit and nuts in this comforting bowl of oatmeal, it will keep me satisfied all the morning long! I am so annoyed when I eat a big breakfast and then am hungry 3.5 minutes later. Steel cut oats always seem to do the job, though! So fun to see Julia on here! You gals are great! Writer’s block ex-lax doesn’t exist?! Dang it. I could use some of that on a regular basis. This oatmeal looks absolutely perfect. I’m not much of a butter girl myself (I know, we’re rare) so I love that Juila uses coconut milk instead. 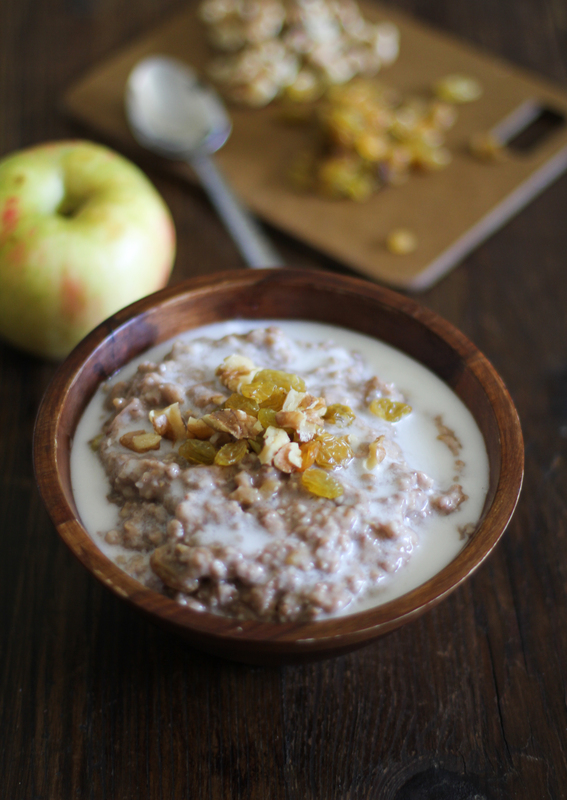 I can’t wait to try it next time I make some oats! Hey–one of my good friends (who, coincidentally is also a master potter–see Stephie’s kitchen pictures of her canisters), is a chemist/pill-maker at Eli Lilly in Indianapolis (think one of the largest pharmaceutical manufacturers in the USA). I’ll get him on this pronto-tonto. Yeah, I’m sure Eli Lilly will be super interested in writer’s block ex-lax…..
omygoodness this oatmeal looks FABULOUS! I want this every morning. Stephie – I miss you! I’ve been such blogging neglecter lately with the holidays, hope you had a great New Year lovely!! I love crockpot oatmeal! It is so nice to have it ready when you wake up on a cold winter day. Great recipe! Pass the oats, please. 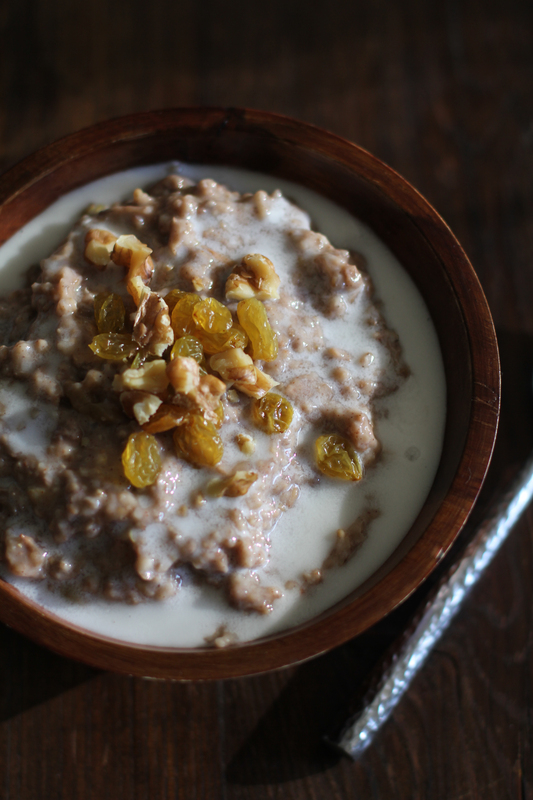 Steel-cut oats are my jam in the winter. Yum! Hi there — this looks delicious, but I do have a question. What size slow cooker did you use? I have a two quart slow cooker, and it seems like it would be the right size, but I don’t want to risk a catastrophe at 3 am in case there is some serious expansion with the oats. Hi Michelle – I am not sure what size Julia uses, but it is probably a 3 or 3 1/2 qt (a fairly common size). I would give it at least double the space to expand, just to be safe. So add your ingredients and see where you are – if you are only about halfway full, then you might be ok! Again, this is just conjecture on my part, so I can’t promise anything, but let me know if it works for you! can you make this in a rice cooker? I don’t have and have never used a rice cooker, so I am not sure. I have heard that you can make steel cut oats in the rice cooker, but imagine you might have to adjust the liquid according to your manufacturer instructions and that it would not take all night to cook. Let me know if you try it! I did this in my rice cooker yesterday it took about 30 min or so and it was really good!! I made this last night and it turned out terrible. I was suspicious about the measurements of water + coconut milk, but did it anyways. It was like rubbery soup this morning. I do not recommend this. Hi Alex, sorry the recipe didn’t work out for you. Did you make any changes to the recipe? Did you use steel cut oats or regular oats? And did you use full-fat coconut milk? When I made the oatmeal, it turned out very thick and creamy – not soupy or rubbery at all…in fact, when I served the oatmeal, I added more milk on account of the fact that it was so thick. Also keep in mind that every crock pot is different, so it could be that your low setting cooks at an even lower temperature than mine. My suggestion for your soupy oatmeal is to heat it on the stove to finish cooking it, as it sounds like all of the liquid didn’t get absorbed. I used light coconut milk and steel-cut oats. Perhaps it was the light coconut milk.